If you’ve been following the twitter feed (@CapeCarbon) – thanks to Laurie Butgereit of Meraka, CSIR, for getting it up and running – then you might have noticed, that not only is the carbon dioxide concentration at the two sites being tweeted, but under certain conditions, the carbon dioxide emissions from Cape Town and surrounds as well. So how am I doing this exactly? As my last post revealed, normally a super computer, or at least a pretty amazing desktop, is needed to carry out an atmospheric inversion for obtaining estimates of carbon emissions. Well that certainly is the ultimate goal, and it’s the only estimate that’s really publishable. But in the mean time, to give people a taste of what’s possible with atmospheric measurements of carbon dioxide, I came up with a method to get a “ballpark” figure of what the carbon dioxide flux is. This is not a statistical approach. This is not a physics approach. But rather an “applied maths” approach. The same type of approach you need to use when your lecturer asks you to estimate how many ping pong balls can fit inside the lecture theatre. Now the name comes from one of my favourite movies, Armegeddon (which probably popped into my mind because of all the meteors that have been crashing down to Earth lately - http://www.geekosystem.com/nasa-explains-russian-meteor/), specifically from the Russian cosmonaut, Lev Andropov, where he calls the America astronauts a “bunch of cowboys” after they've just caused his space station to blow up. There’s a scene where he bashes a spanner against the space ship to get it to work, and it springs to life. Well this is my way of smashing a spanner against the measurements to get them to give emission estimates. The first thing that needs to happen is that the wind needs to be blowing in the right direction. 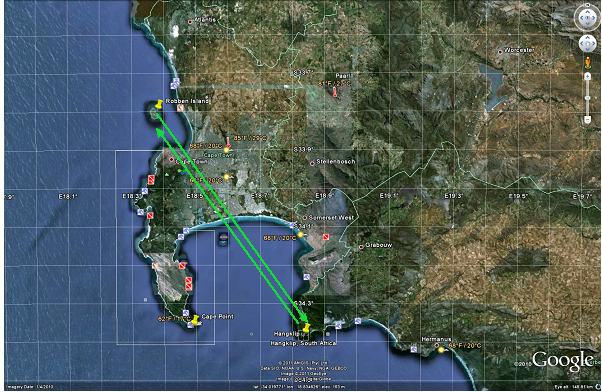 It needs go from one of the measurement stations, over Cape Town, and directly to the next measurement station. So this is either when the wind is blowing from the South East or from the North West. We also need to know how fast the wind is blowing. Fortunately we can get all of this from the South African Weather Service (SAWS Cape Town Weather). Map showing the required wind directions in order to make flux estimates based on the difference in CO2 concentrations between the Robben Island and Hangklip sites. Map generated using Google Earth. Then we need to get the difference in carbon dioxide concentration between the two sites. If the wind is coming from the North West, then we want Hangklip – Robben Island, and if it’s from the South East, then we want Robben Island – Hangklip. This difference then needs to be converted into mg of carbon dioxide per cubed m. This can be done using the ideal gas law. Now this is where the serious wangling comes in. The first major assumption that we need to make is that the wind is travelling in a straight line from station A to station B. Then we need to assume that the wind speed is constant. This won’t be 100% correct, but we’re not going to try and model the wind fields for this exercise (that’s what the super computer is used for). Then my thinking is: imagine this concentration of CO2 as a cylinder with a 1m2 base and 1m in height. The cylinder starts off at station A and then travels towards station B at the speed of the wind in a straight line, a total distance of 77.4km. Along the way, the cylinder is going to collect or lose CO2 due to processes taking place on the surface. 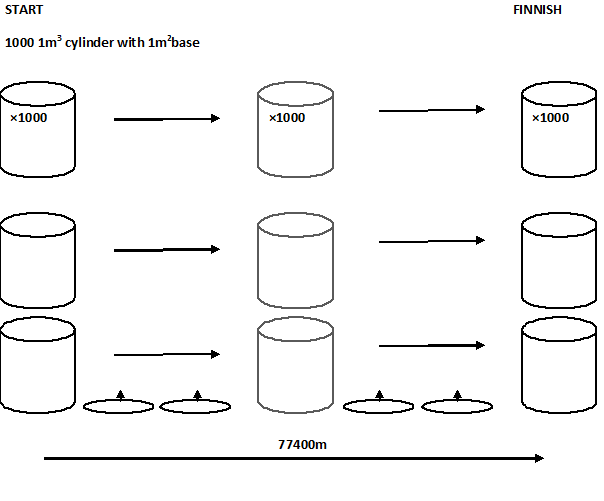 There is also not just one cylinder at a particular point, but cylinders stacked up on top of each other until they reach the planetary boundary layer. To start off with, just to keep things simple and manageable, we’re going to assume that all the cylinders are moving at the same speed. This is not true, because the higher up in the atmosphere you go, the faster the wind is going. What I plan to use in the future is the wind profile power law (http://en.wikipedia.org/wiki/Wind_profile_power_law). The planetary boundary layer extends from the surface to height of up to 3km, depending on the temperature and other factors (http://www.sciencedaily.com/articles/p/planetary_boundary_layer.htm). It’s where the air is most influenced by what’s happening on the surface, and it’s pretty hard to model. This height is required in order to make the estimation of the CO2 fluxes possible, and so, for starters we’re just going to assume that the height of the planetary boundary layer is 1000m, which I grabbed from a study on North America, but for an area of similar latitude (http://www.meteor.iastate.edu/~jdduda/portfolio/605_paper.pdf). As the tweets get a bit more advanced, I will try to change the PBL depending on the time of the day and the current season. 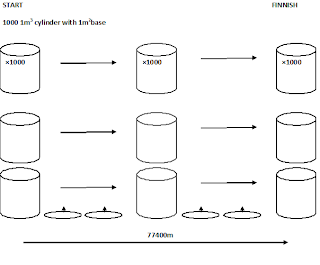 = The amount of CO2 emitted or absorbed per m2 per second × the total distance travelled × the total amount of time spent per m2 / the total number of cylinders in the stack. So far the values that I've tested this on are in the right range, so I'm happy that the estimates are at least of the right order of magnitude. During the mornings we have seen that there are negative fluxes observed. This is because photosynthesis has kicked in. 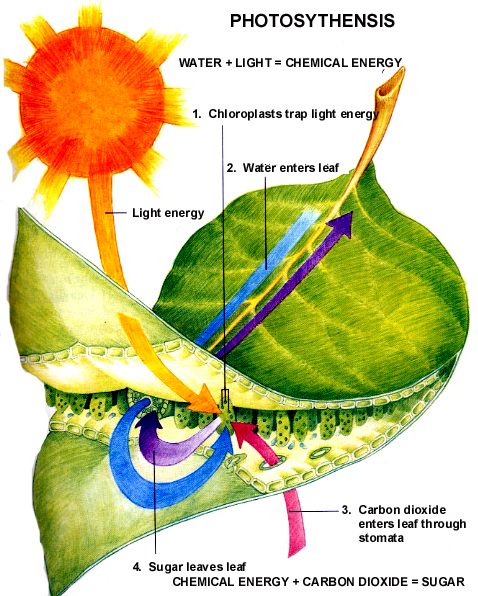 During the morning, the stomata open up, and allow CO2 to passes into the plant cells. At the same time water vapour can also leave the plant cells. If it starts to get too hot, the plant needs to be careful that it doesn't dessicate, and so it has to control how open it's stomata are going to be, which then limits the amount of CO2 that can be absorbed through photosynthesis. If there's one thing I hope people take away, it's the important role that our natural systems play in regulating the atmosphere in which we exist.